This is our personal collection page, some stories and hopefully some helpful hints to the collector that we can share. The picture below shows a very small part of our collection. We hope to put some more pictures of our expanded collection on this page in the near future. A small portion of our sorting tables holding our collection. I spoke with you last year and you were so kind to offer my husband and I a guided tour of the factory in East Liverpool. (We have a lot of information on the Hall Autumn Leaf Pattern on our website NEACA.com ) I heard recently from some local people in your area that the company is in trouble and laying off workers. Last year word got out that Fenton was going to close its doors after so many years in business because of a lack of orders. When the idea of possible closing got out they received so many orders that they didn’t have to close down their plant. We want you to know that if there is anything we can do to help by notifying collectors through our website or any other way we’d be more than happy to do that. We get over 7 million hits a month on our website. We still want to get down there for a tour, maybe mid July. Our granddaughter will be playing in a softball tournament in the Youngstown area which isn’t all that far from you. Thank you for your email of June 12, 2008. Business here at Hall China has indeed slowed down this year as rising gas and food prices have taken discretionary dollars out of people's pockets. The result is that people are dining out less, and the restaurant chains who are among our largest customers have therefore needed less replacement china from us. The slowing economy has also caused the chains to cut back on building new restaurants which has an impact on our business. We have had to lay off some employees as a result, but our specialty business continues to do well, and last year was a very good year for us. As you may know, we have recently updated our website with expanded retail products and the response so far has exceeded our expectations. We think that once the uncertainty of the presidential elections are over this Fall, and if energy prices settle down a bit, consumers will feel more comfortable eating out and our principle business will return to more normal levels. We've been through many economics times like this in our 105 year history and hopefully this recession will be a short one. If you are in our area in July, please give me a call and I'll be delighted to give you a tour. Thank you for your interest in what's going on here at Hall China. We are happy to hear that the gloom and doom isn't as bad as we heard. But just to guarantee that no closings occur I would hope all you collectors remind your favorite restaurateur that if they need new china (when don't they?) please give Hall Company a call. Dave’s affection for Hall, Autumn Leaf China began as a young boy growing up in upstate New York. The Jewel Tea man visited his home on a regular basis and his mother purchased groceries, household goods and Autumn Leaf China, which was a premium. His family owned and operated a bar and restaurant during and after World War II, which was named “River View Inn.” His mother bought all kinds of stuff from all types of traveling salesmen. Between “Max the Jew” who always wanted to “buy David” and his mother’s threats to give him away to the “rag man”, the Jewel Tea salesman was probably a pleasant diversion among fond memories of food. Along with Friehoffer's horse and wagon delivering baked goods and bread the Jewel Tea man posed no threats. For anyone who doesn’t know what a premium is, it’s something you can purchase at a special price after purchasing a particular amount of groceries or other items. Things like that still exist today in the supermarkets we shop in. There are sets of china, pots and pans, tableware and any number of things you can still indulge in. 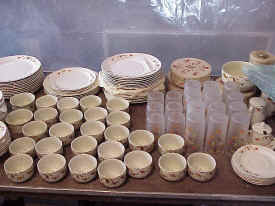 Then as now, if you purchased a particular amount of groceries per week, then $5.00, now perhaps $50.00, you could purchase a dinner plate, bread plate, cup and saucer and if you saved your shopping and bought larger amounts at one time, you could buy a place setting or even a starter set which might be 4 place settings. And so it went adding serving bowls, casseroles, sugar and creamer and even ice tea pitchers. The Jewel Tea man visiting the homes made it that much more special and easier to buy. I grew up in a slightly more urban area on Long Island, New York with A & P “grocery stores” as they were known before they were titled “Super Markets.” And then there was Bohack's, which was the best place to buy fresh cut meats. There were premiums available through both of those stores but the china was by companies such as Edwin Knowles, and one pattern I remember very fondly, Harlequin by Homer Laughlin. As was the case with both of our families, nine children in Dave’s and ten in mine, not much china survived. At least enough Autumn Leaf pieces remained from his childhood for Dave to introduce the pattern to me. One was an old chipped and worn bowl left from his mother. He always told me about his “cereal bowl” he used as a kid but the one he remembered didn’t exist. It finally turned out to be the bowl of the drip jar, without the lid, which was probably broken at some time, that he remembered fondly as his cereal bowl. In the early 1990’s we went to a “clean out” auction. That’s when an auctioneer starts with an unsold box lot and keeps adding to the lot so one person might end up with 25 or more boxes when the final gavel falls. The items in the massive box lot group we purchased were so dirty I set up a large bucket of soapy water and another one with clear water outside the house, just to get the stuff clean enough to bring into the kitchen and wash it in the sink. There were many hidden treasures but the one that struck us both was the smallest of the set of mixing bowls. When I first picked it up it was black with nothing but the shape visible. After the first wash and rinse we could see that it was absolutely mint. That led to more auctions, and more purchases and advertising to buy a piece or a collection. Now, approximately 17 years later we have a mint service for 20 and lots of serving pieces along with many hard to find pieces. In the months to come we will be re-inventorying our collection, weeding out, upgrading and taking photos to share on our website. For those who have been bitten by the dinnerware-collecting bug, I will also share some helpful information we’ve learned over the years. From time to time we hope you’ll stop by and visit and perhaps pick up a tip or two. However ... We will no longer pay for any items until we receive them for inspection and determine whether the "Mint" pieces are really just a bunch of junk! If you want to sell us anything ... put your price on it, send photos and descriptions and we all will arrive at a price. Ship it. When we find out it is as you describe we will immediately send payment. If it is not what you say it is we will return it. There are just too many people out there trying to pull the fast deal ... others who won't take the time to evaluate what they want to sell us ... and others who just have no idea of things. One way or the other you have to be accurate. In any case, before you want to sell us your collection ... go thru the steps. If you want to keep your Autumn Leaf china and other fine china in like new condition, don't put it in your dishwasher. It may save time but especially any china with a gold, silver or platinum border, washing in a dishwasher will decrease the pristine look and the value over time by wearing off that crisp pattern and shiny border. This also applies to patterned tableware and gold or silver plate. Hand washing with a normal dish detergent is the best way to care for your china. Putting 1/4 cup of vinegar in your wash water also helps to keep soap film off of both china and glasses. When storing your china between uses, it is very helpful to place something in between each item. There are things made specifically for this purpose. Similar to coffee filters only thicker, they are cut in disk shape to put between plates. If you can't find those, paper napkins or paper plates will do. I also use this method on my every day dishes and they still look like new. It saves wear every time you take them out of your cabinets. In some of our descriptions of plates we have for sale we may say "like new" or "mint" but item shows stacking wear. Why not just be careful so when yours is passed on to the family or a collector it is really still in "mint" condition. Visit Jewel Tea Sales.